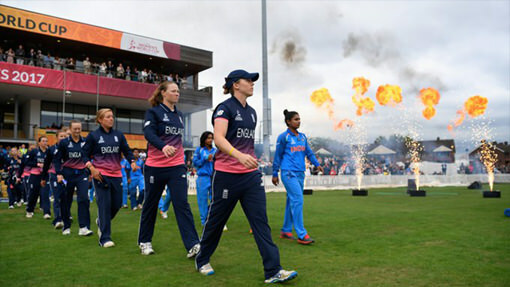 The Women’s Cricket World Cup was an international tournament that took place in England. Eight teams qualified to participate in the tournament and competed in 31 games across 5 venues. Entertainment Effects were approached to supply some special effects for every match across the month long tournament. The main challenge was bought about by fixture congestion, the tournament schedule meant that on certain days 4 matches were being played simultaneously. This meant that we would require dedicated special effects equipment for each venue. 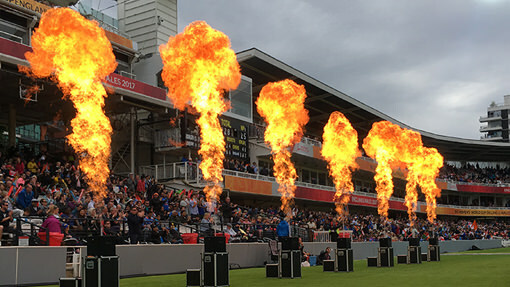 We had previously provided flames for another International tournament but there was only one game per day which enabled us to move equipment between matches. The cost to supply pyrotechnics at 4 consecutive matches became cost prohibitive against the budget so we had to find an alternative product. We presented a different product to the client, our Colour Blast Banners. The product comprises a powerful air fan and a large sheet of coloured material. When the fan is powered on the coloured material ‘fly’s and flutters’ in the air. It’s a great cost effective way to bring some colour to an event. The purchase cost of the equipment is significantly less than the pyrotechnic devices, which enabled us to provide 16 units at each of the 4 venues within the available budget. The coloured banners were located around the perimeter of the pitch and were flown at key moments of the match like wickets, sixes and fours. The banners were produced in 4 different colours to match the event branding and some of the banners were also branded with the event logo. It was a fantastic event with a sell out crowd to watch the final in London, which England won against India by 9 runs.